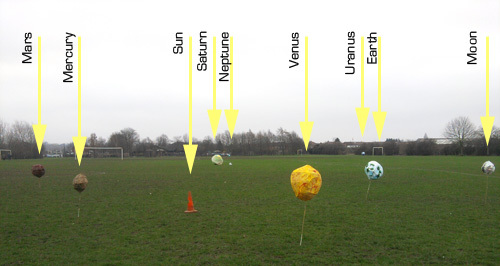 I spent last Friday working with two Year 5 classes at Wyvern Primary School in Leicester as we explored an alternative method of teaching the Sun, Earth and Moon module. (scheme of work). The day I worked on was split into 2 2-hour sessions, one with each class. I burst into the lesson, announced launch to be in T minus 20 minutes and set about calling out the crew names whilst the teacher set the countdown timer going on the whiteboard. Our mission was a fact-finding one – we had to check the accuracy of the Guide’s entries in order to determine if we wanted to try and obtain the full version (the versions we had were trial versions limited to the solar system only). After launch and hyper drive out to the edge of the field solar system, our teams of astronauts navigated their way sun-wards visiting different planets and checking the information given by the Guide against what they already knew or could deduce. Unfortunately the entry for planet Earth was entirely unacceptable, so we agreed to spend time collating our own facts which we would then send to the publishers so they could put this straight. I placed the planets out on the field so the relative distances between them were correctly scaled (although I forgot to get an orbit diameter for the moon). The planets themselves were not to scale, which is just as well because with these distances between them, we’d have had to have made the Sun 15cm across and Earth only 1.3mm across. A favourite moment was glancing back onto the field after I’d placed the planets in position to see a crowd of dogwalkers and dogs gathered around Saturn scratching their heads and wondering what was going on! GPS-triggered thing for a Creative Partnerships interview. We’ll be re-writing entries for a Hitchhiker’s Guide to the Galaxy-esque publication to give more detail on the Earth, Moon and Sun. There are currently a wave of Creative Partnerships calls being circulated and, since this is where I earn most of my income, that means I’m currently writing a lot of Creative Partnership proposals and attending interviews etc. My work is intrinsically cross-disciplinary and I’m also a serial collaborator. My philosophy towards collaborations is that they should ideally enable both parties to work in ways that they would not have been able to do if they were working independently. I’m interested in processes of challenge and development for everyone involved. I aim to make my design process as transparent as possible so that elements of it can be applied to later projects. My skills and enthusiasms complement yours – when we work together (rather than me delivering at you) that’s when things start to be really successful. I can bring enthusiasm, sensitivity, strategies for engaging pupils, adventures, a can-do attitude, experience of what has worked well in the past, making skills, gadgets and cunning devices; I’ll be looking to you to bring knowledge of curriculum content, awareness of the pupils’ abilities, constructive criticism, and a willingness to give things a go. I’ve done enough projects now that I can clearly identify the active participation of the teaching staff as one of the – if not the – most important factors in determining the long-term success of a project. Those things I say I’m looking for staff to contribute are there for very specific reasons, both to underline what I expect from them and what I am unable to contribute. So, by the time I am invited to interview, both parties have been very explicit in setting out expectations of collaboration, partnership and co-delivery. Turning up at a school I’ve never been to before, working with a group of children I have never met before and whose abilities I have no indication of, to deliver an activity that somehow responds to a pressing need within the school, but which I only know through maybe a few sentences as part of the published call for practitioners. No knowledge of the space, no knowledge of the people, minimal knowledge of the context, superficial knowledge of the curriculum and only guesses at where the children are in relation to it. Worst of all: no conversation and no collaboration. I have to prepare and deliver these sessions in isolation. Apart from the obvious grumbles about having to prepare and deliver a lot of work without getting paid, I seriously question the relevance of interview workshops in this format. Certainly I don’t feel they reflect upon my practice or my approach to working in schools. In addition to this, if I’m proposing an Agent N project in which I appear suddenly and initiate a several-day-long adventure, it’s difficult to frame popping in for a 20-min activity in the context of whatever that story may turn out to be. My main hooks and strategies only work properly within the context of that immersive experience and I have to be really careful not to damage that ahead of time. 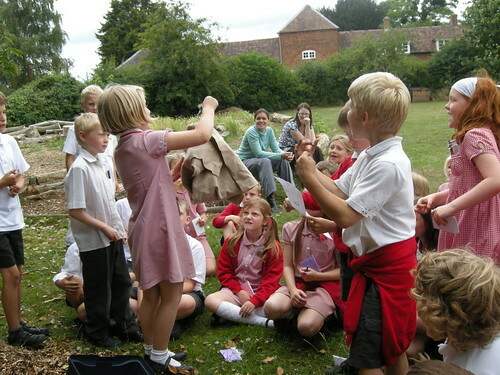 So, how can we better address the needs of the school in selecting the right person to work with them on their project, and the needs of the creative practitioner in communicating their skills and approaches? Fundamentally, I think the interview needs to establish whether the working relationships are likely to succeed. 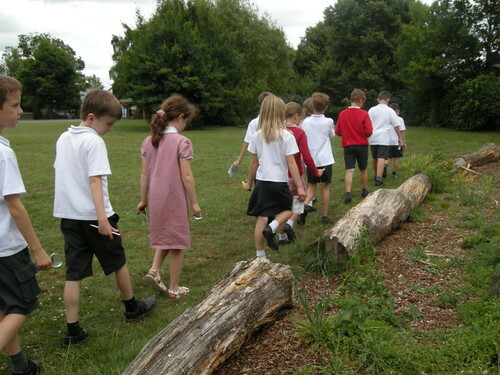 From my perspective, Mowmacre Hill Primary School – a school I’ve worked for twice now [1, 2] and have a lot of respect for their approach – have come the closest to tackling recruitment in a sensible and constructive manner. Candidates were invited to the school where we were interviewed, a few at a time, by the school council. Actually, we got a pretty intensive grilling! 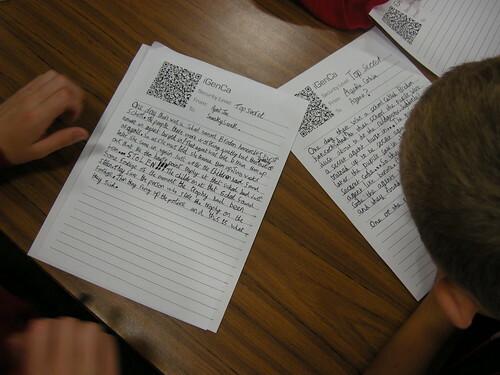 The children knew their agenda and what they wanted, and the questions they asked were searching and perceptive. 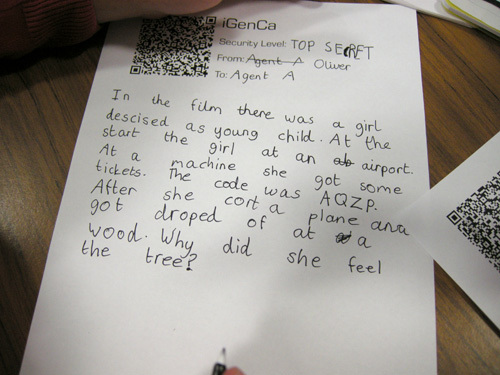 I believe the questions were also prepared independently of the teachers. Being interviewed with a few other practitioners at the same time meant that we could bounce ideas off each other and also that the conversation could run for a significant length of time. Teachers were present to basically chair the conversation: making sure everyone got a chance to speak and to fill in extra details where needed. 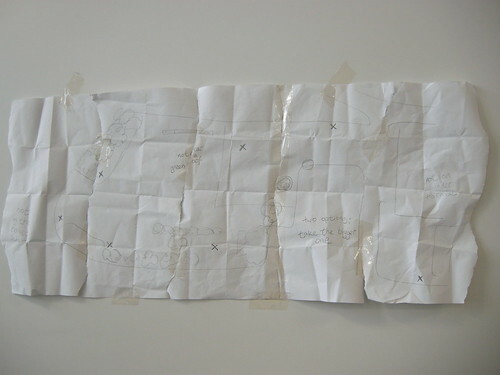 The next stage in the (paid) half day was a workshop activity, but one working with a pair of teachers: three or four practitioners spent an hour or so ‘planning’^1 some initial ideas in response to the brief. This gave us a chance to really find out what was behind and under the brief as laid out in the tender document. 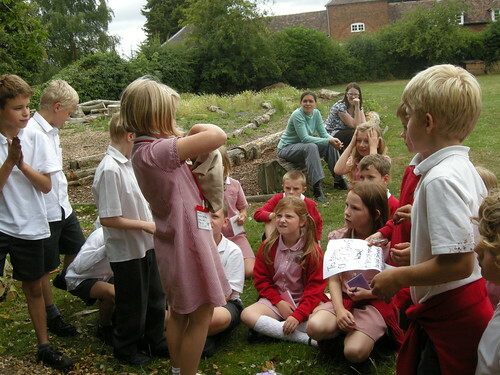 What changes would you make to tendering processes for artists and other practitioners working in schools? How would you get a collaboration off to a good start? Can you represent your practice in 20 minutes from cold? How useful are interview activities in helping you identify the people you want to work with? The comments are yours, I’m interested in getting some different viewpoints on this. 2: I remember very clearly getting a rollicking in about 1996 from my A-Level art teacher about having too fixed ideas about what outcomes were going to be and being blind to the interesting stuff that crops up along the way. I generally consider that ideas at the start of a project are likely to be wrong ideas. Also, creating is, after all, about arriving at something new and that implies a journey of some sort without knowing exactly where you’re going to end up until you get there. Part one here, related posts here. Click on images to see the larger versions on Flickr. Have you got what it takes? from sneakysneak on Vimeo. A message for Team Alpha from sneakysneak on Vimeo. 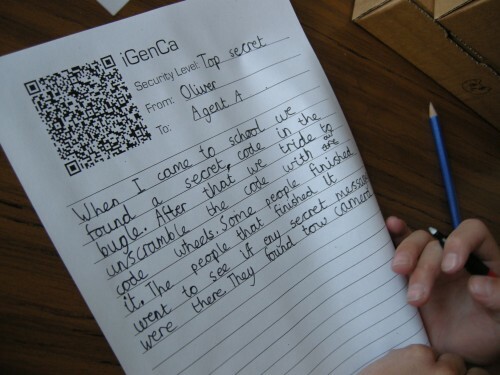 Having previously been trained up as special agents, it was only a matter of time before the Year 3 and 4 pupils at Bredon Hancock’s school received their first mission. 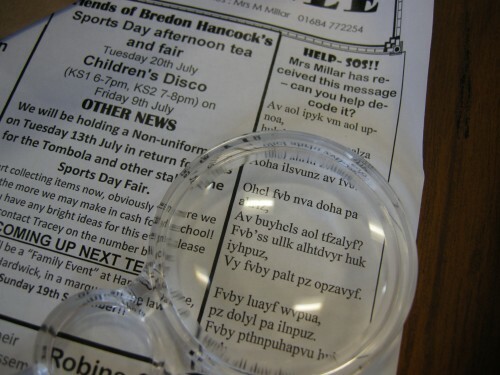 Yesterday morning, whist reading through their weekly newsletter – the Bredon Bugle – the agents noticed a strange article which they recognised as being in some sort of code. Or your item is history. It didn’t take us long to figure out that “bird of the night, and another brightest blue” was a reference to the agents in their normal pupil roles as Owls and Kingfishers, but what did the rest of the message mean? I called a team to help me work through the rest of the verses and someone suggested that ‘entry point’ could mean the main entrance to the school. Another agent had spotted some new state-of-the-art security cameras had been installed in that area, so we went out to have a look. We located two of these cameras and decided we would have a look at the files on them to see if they had caught anything useful on tape. The first one we watched showed us a person (that we recognised from previously intercepted footage) breaking into the school and then leaving again having wrapped something up and put it in her rucksack. She had some sort of device that zapped the camera though, so we couldn’t see everything. 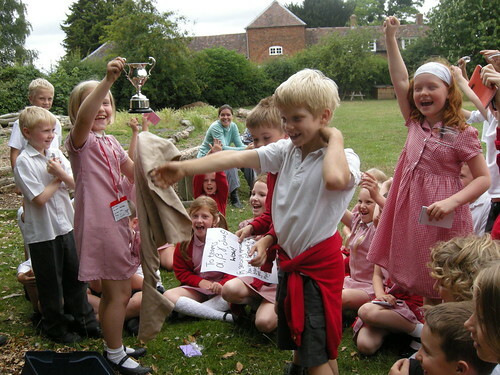 When we looked at the footage from the other camera (that the intruder hadn’t spotted or zapped) it helped answer some of our questions: she had taken the sports trophy! CCTV footage of the intruder from nikkipugh on Vimeo. 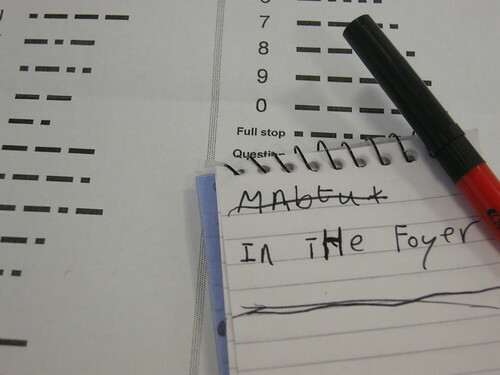 Now the coded message from the Bugle made a lot more sense! 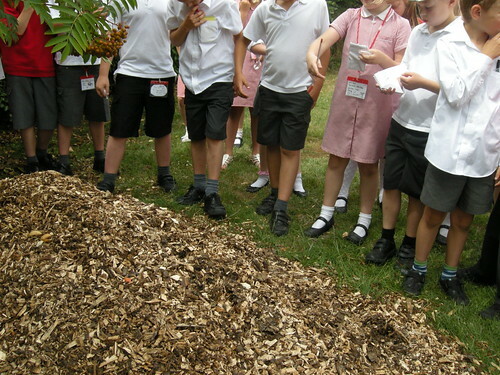 We also knew we had to get permission to launch a full-blown mission, so our next task was to summarise what had happened in a report to Agent A to explain why it was important for us to investigate this. Mission initiation report. What do we need to put in it? We sent the reports off, but then realised we had to act fast if we were to be able to interview someone who was likely to provide some key evidence in our investigation: Mrs Greenwood the cleaner went home after lunch so we had to speak to her fast! Are they are good enough? See what they do and who they tell? Are they a good team? What were we to make of that? While we were thinking, a message came back from Agent A giving us permission to go ahead with the mission. We used the school’s recording devices to interview the head mistress (who had information about the security cameras) and the secretary (who had information about what state her office was in when she arrived at work that morning). From what the cleaner and the secretary had told us, we decided to see if we could lift any fingerprints from the scene of the crime. 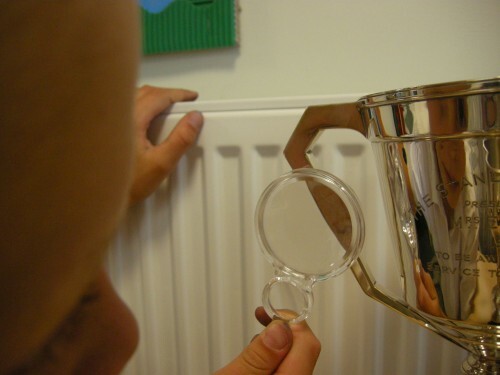 First we practised getting prints from our own fingers and then a few of us went to look in the foyer to see if we could get any off the remaining trophies, the door or the reception hatch. Unfortunately we were unable to lift any of these prints, but we had a really close look and decided that the ones on the door and the hatch were probably the same. From the to-do list that the intruder dropped, we knew she was watching us to see who we would tell about what had happened. I was unable to join the special agents today, but I believe they were compiling a special edition of the Bredon Bugle to tell EVERYONE. 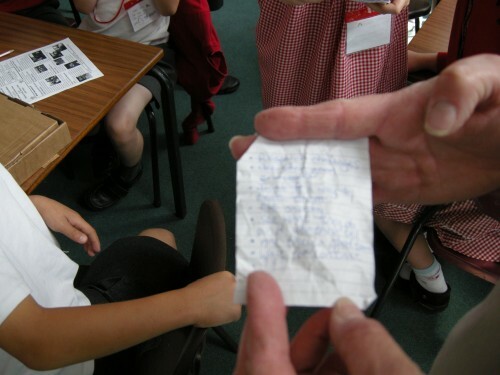 Another post relating to Phase 1 of delivery of an Agent N project designed to inspire creative writing and foster curiosity amongst a group of Y3 and Y4 pupils. 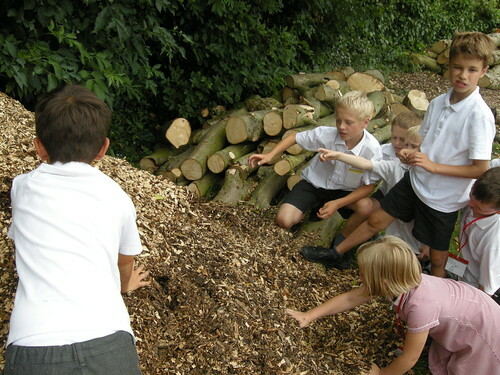 Whilst the pupils were winding up the training camp with a piece of reflexive writing, I took the opportunity to take a couple of them outside for a bit of feedback on the goings-on of the previous two days. Rather than shoving a microphone in their face, I used some binaural microphones that look like earphones and just wore them around my neck. I’m repeating most things they say because I wasn’t sure if the mic was picking them up or not! 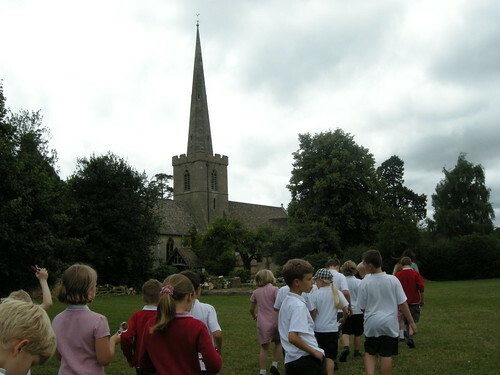 Last week I spent the first 2 of what will be approximately 6 days working with the Year 3 and 4 classes at Bredon Hancock’s Endowed First School in rural Worcestershire. My brief was initially to “inspire their children and staff to write with imagination, creativity, enthusiasm and confidence”, but this has since (I think in part as a result of conversations at my interview, which I did in role as Agent N) been expanded out to also try and foster a spirit of creativity, experimentation and enquiring minds in a more general sense. Staff and pupils. 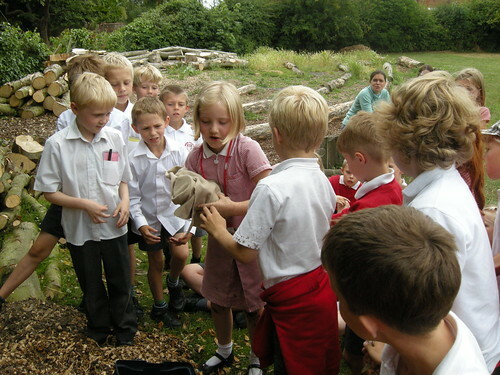 I’ve worked on several Agent N projects up until now: immersive experiences taking place over 3-5 days in which the pupils have an overarching challenge to work on and, as a part of this, investigate different areas of the curriculum. Whilst I’ve had enormously positive feedback on the effects of these, I think there’s still plenty of scope for improvement, so with this project I have changed the structure to explore ways in which to hand some of the authorship back to the children. This has resulted in the delivery being split up into sections. 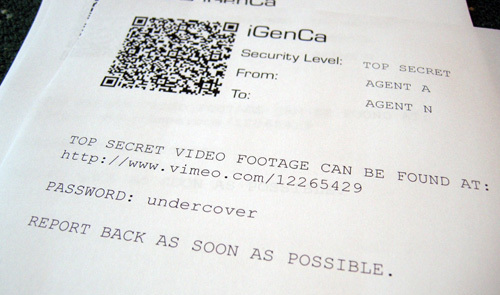 Last week was the first of those sections: a 2-day special agent training camp. 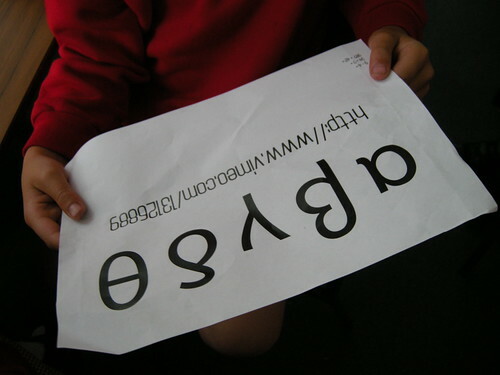 Relinquishing some of the design decisions started well in advance of the delivery time in school when I recruited a friend – 8-year-old Agent M – to help me prepare a video for the trainees to respond to. I wanted a video of an operative in action. 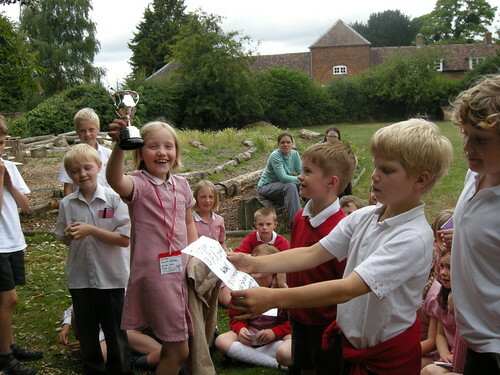 The action involved had to be exciting and intriguing, but not so prescribed that the the pupils in school couldn’t come up with a large range of different interpretations. I had a few locations in mind, but the filming was done as part of a weekend away with friends, so even those decisions had to be flexible. operative from nikkipugh on Vimeo. I’ve never seen 40 children sat with such rapt attention before! We played the video a few more times, pausing in places to give the trainee agents a chance to write down any important details or questions in their special agent notepads. 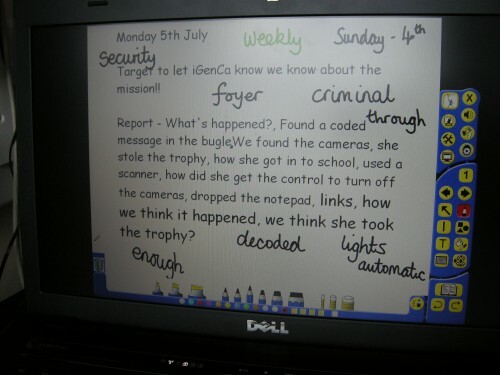 After a bit of discussion to get a general idea of what they thought was going on, the children were asked to write up their reports for Agent A. In the film there was a girl disguised as a young child. At the start the girl was at an airport. At a machine she got some tickets. The code was AQZP. After she caught a plane and got dropped off at a wood. Why did she feel the tree? The lady typed in AQZP. She walked up to a plane netting and stopped. The man walked to the plane. The lady ran to a tree and found a bag with a book in it. It might have been a clue. She ran to a farm track and stopped and ran a bit more and stopped again then suddenly pointed at a farm house. She ran down to a beach and crouched down to touch the sand. She was concentrating on the texture of the sand. Then she ran to a castle on a hill. I think she might be an agent on a mission. She was wearing black and she looked like she was on a top secret mission. She typed into the computer AQZP which looked like a code. She thought carefully about what she was doing as if the time was running out. She recorded stuff in her notepad. 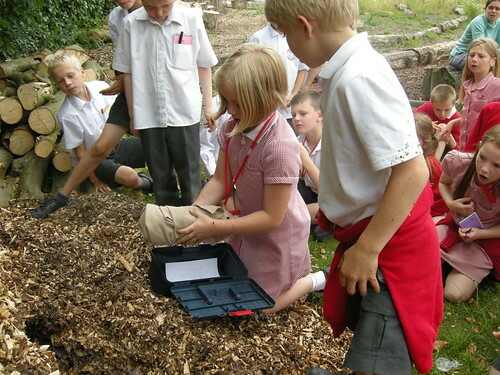 She thought carefully about stuff she found and used it to help her. She looked around carefully in case anyone watched. She looks as if the time was running out and she had to go with the flow. She was just guessing and running. She wrote something into the sand. She felt the tree as if the tree had put it there. On the DVD I think that there was a girl in an airport and she went there. 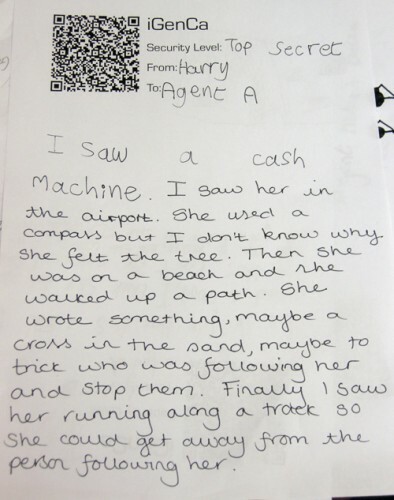 A cash machine or ticket machine and then she looked at the plane and went to a woodland when a plane went overhead. I don’t think she wanted to be seen because she was sneaking. She picked up a bag and ran to the beach and made a sign in the sand. It was something like this [picture of an arrow]. She was disguised as an old gran. She had glasses like this [picture of glasses]. I think that the code at the beginning was that she was ordering some clues to find where she needs to go next. Next thing she was taking facts about the airport. Trying to get the right plane. Missed the plane. I think that she was undercover because she has glasses and a hoody. I saw some dead drops that the agent was finding. It was an agent on a mission I think or she was finding information. An agent was on a computer on Flybe. In the corner of the screen I saw a word that was WHSmiths. 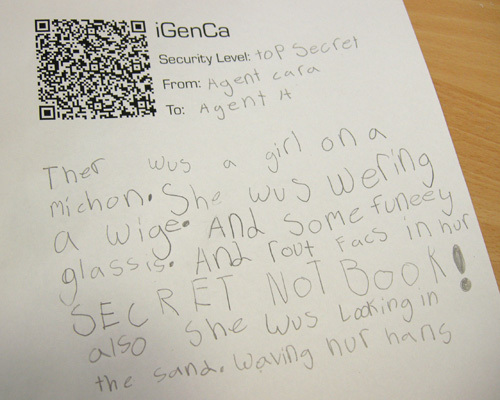 The agent at the end was a bad agent finding clues about the good agent. I can’t work out why the agent at the end was feeling a tree and feeling the sand. 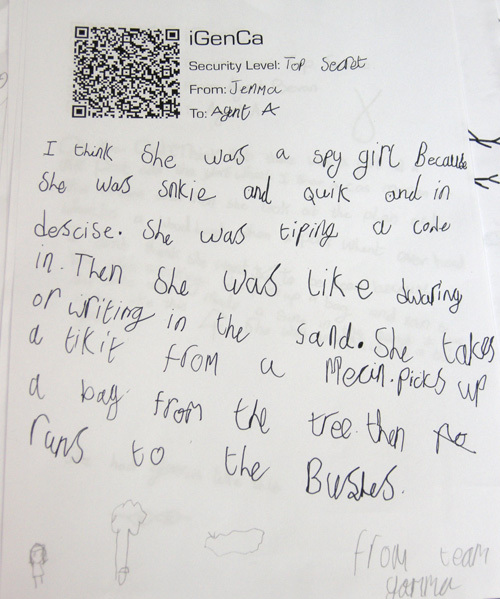 The agent was writing the code AQZP to get permission. So far my 2010 has been very focussed on schools and learning as I first spent a week responding to the second wave of Creative Partnership calls for this academic year and then attending interviews as a result. Roughly half of the interviews I am invited to involve having to deliver a short activity (10-20 minutes) to a small group of the children. Considering my whole approach to projects is based on collaboration and a particular process aimed at responding to each individual context, it’s quite strange to find myself being judged on solo delivery of something workshoppy to a group I’ve not had any previous contact with! I’d like to think that with my cross-disciplinary background one of my main selling points is that with pupil-led projects I’m pretty well equipped to be able to bring in practical skills that relate to wherever we end up. This too makes it tricky to decide on just one activity to represent me, because I’m not working from a starting point of offering a particular medium in response to a brief. Again all about the process. Anyhoo, irony of the situation aside, these activities can be very interesting in their own right. On Monday I was in a school that was looking for someone to help facilitate Year 5 (9-10 years old) in designing and making their “Museum of Water”. I was really interested in this call because of the way it had been presented as very pupil-led and also because, through my work with pervasive games and hackerspaces, I’ve been involved in various conversations coming from museum professionals that resonate strongly with those of schools. We all want meaningful interactions. 15 minutes isn’t really enough time for introductions and then anything much in the way of making, so I decided to aim for something much more feasible …like a paradigm shift! I wanted the school to see their museum-to-be not as a collection of objects, or of documentation of learning objectives, but as a process. People go into the museum and the museum has some sort of effect on them such that the people leaving the museum are slightly different to when they went in. Otherwise, what’s the point? I started the session in my favourite manner – by getting things wrong. Hi, my name’s Nikki and I do all sorts of creative stuff. I’m here because I saw your advert for someone to help you make a Museum of Water. Can I have my £3000, please? What’s wrong? Can I have my money please? 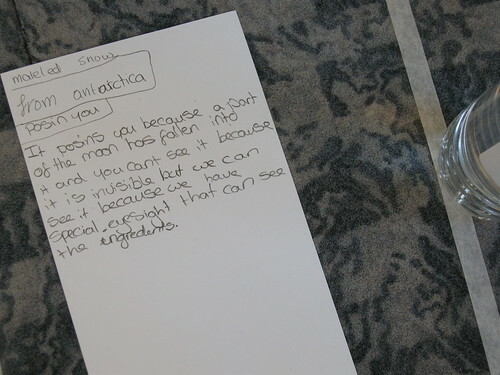 From this starting point, we were able to have a conversation where the pupils explained to me that, even if I labelled the water, just to have a bottle of water on display wasn’t good enough – they wanted a museum that was interactive and taught people interesting things. They weren’t very impressed with my offering at all. My next move was to invite everyone down to the other end of the room where I had cleared some floorspace. Within the context of what they had just told me, I introduced the idea that I wanted them to think of their museum as an experience machine. I wasn’t interested in what was inside it right now, but I wanted to think of who went in, and what we wanted them to be like when they left. 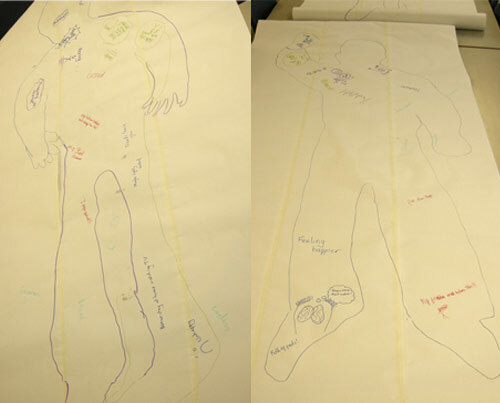 Two of the children lay down on some large pieces of paper and struck appropriate poses whilst we drew around them. First of all we gathered around the outgoing visitor and noted and sketched our thoughts about what we wanted people to be doing and feeling after visiting our museum. I was really impressed at the contributions made in what I think was less than 5 minutes. At one point I announced I was going to write down the obvious and added “happy”. This triggered a conversation about whether we would ever want people to leave the museum feeling sad. Yes they said: there were some very serious things relating to the topic of water and they might want people to be moved by these. When I asked for an example, one boy said that sometimes people drown in water. We agreed it would be important to teach people how to be safe. With very little time left, we quickly added some thoughts to the picture of the incoming visitor. These were very illuminating in terms of how they perceived museums. Or how they thought museums were perceived – anyway, a very stark difference to the very positive picture they had painted in the previous two activities! And that was the end of the session ..or it was supposed to be: it took a bit of effort to get the children to stop adding to the picture! They’ve set themselves some very high standards in light of what appears to be a somewhat challenging target audience – I hope they can realise them. 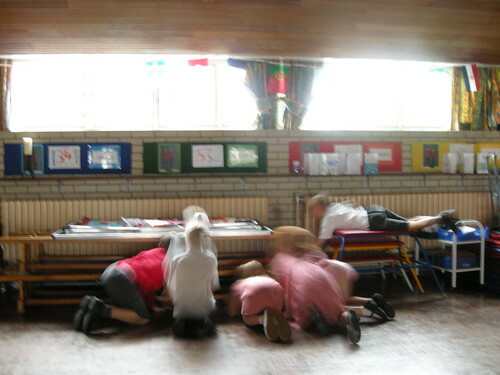 I was asked if I would run some workshops as part of Mowmacre Hill Primary School’s Creative Learning Day – a day aimed at trialling a range of creative learning activities and developing the pupils’ role in the planning, reflection and evaluation stages of Creative Partnerships projects. 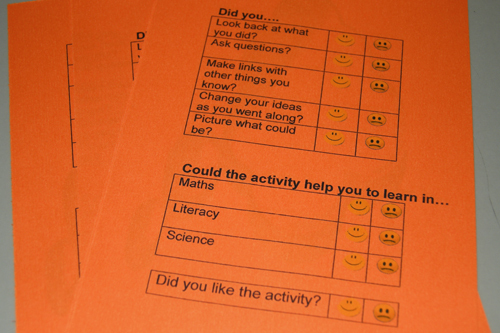 So, I needed to provide an activity that would work with children aged 5-11 years old and would provide a framework for the areas of creativity. After some discussion with the Creative Agent (representative from Creative Partnerships) we decided to use a version of Emergent Game. Given that at least 50% of the adults who play Emergent Game pay to keep hold of their avatars, I thought it would be prudent to change the format to one that didn’t involve soft toys! 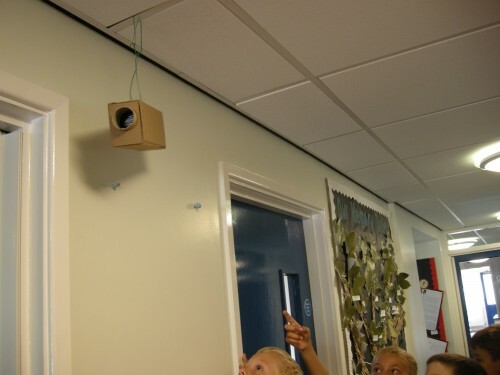 I was also keen to build on the immersive experience work I did earlier this year at Linden Primary School, and experiment with how key strategies from that might be scaled down into something much smaller. In this case, a workshop lasting about an hour. 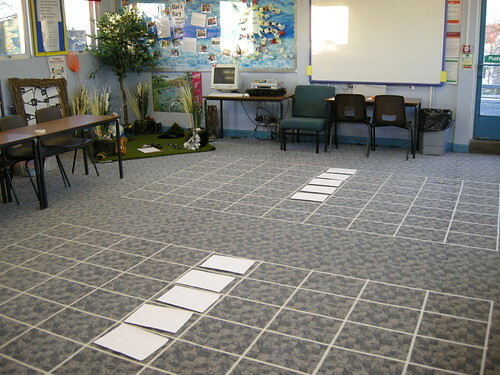 Starting off in a room next door to where I had laid out the grids, I first introduced myself as a secret agent. I wasn’t allowed to tell them much about my job, other than that we were on the lookout for fresh talent to join my department in the years to come. People who can notice the smallest details. People who can think the biggest ideas. People who can tell the best stories. People who can imagine the wildest dreams. I then informed them we would be doing a series of missions as a sort of a job interview, and I would be watching to see who had the skills we were interested in. We also wanted people who were good at team work, so I gave them 1 minute to get into pairs (preferably with someone from a different year). After that, I told them our missions would be based around investigating some mysterious liquids. 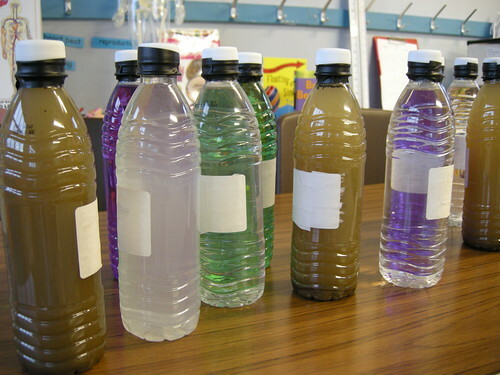 The scientists in my department had no idea what these liquids were, so we needed the pupils to figure out what the stories might be so the scientists knew where to start with their research. 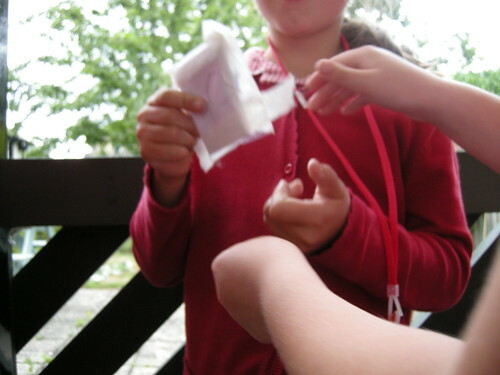 The mysterious liquids were all in a rucksack and the teams of special-agents-in-training did a lucky dip to get the one they would be investigating. Whilst the bag made its way towards the back of the group and after the initial exclamations of “its just water” had been heard, I reiterated the four skills, asking after each one if they thought “its just water” would be the sort of thing we were looking for. Generally, they thought not! What is the name of your liquid? What is the best thing it has ever done? From this standing start, the children only had about 3 minutes to come up with the seeds of a back story for their mysterious liquids. Where some of the older kids were sniggering and wanting to say their mysterious liquids were urine, I called their bluff and demanded more details. Next – to some embarrassment from aforementioned sniggering kids – was the reporting-back session, where each team told the rest of the group what they thought their mysterious liquid was. This gave me a chance to make sure everyone was entering into the spirit of things and identify the very few who were unable to see anything more than a bottle of water. It also meant that everyone could see what sort of standard was being set and what they had to match up to. 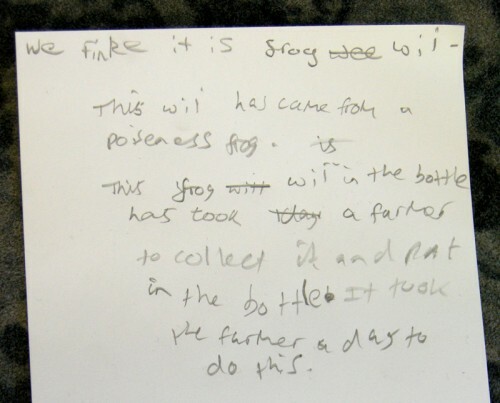 Next I unleashed the remaining missions: one asking them to write a postcard from their mysterious liquid to one of the other mysterious liquids; one asking them to design a creature that might live in the liquid, giving me information about what it looks like, how it moves and how it breathes; one asking about what it might have been used to wash clean; and one explaining where the liquid might (and might not) like to hang out in school. 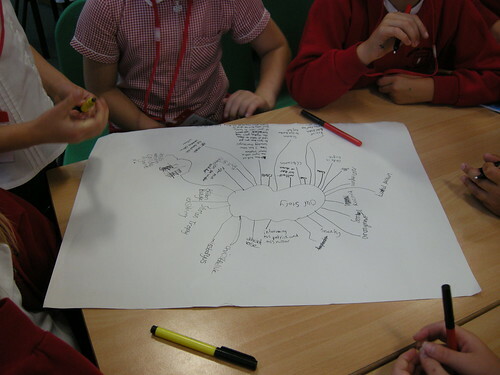 The creature-designing mission was by far the most popular mission, but again the pupils did amazingly well, with most of them completing all four missions in something like 15 minutes. We concluded with a second reporting back session lasting about 10 minutes in which each team was asked to share their best mission. 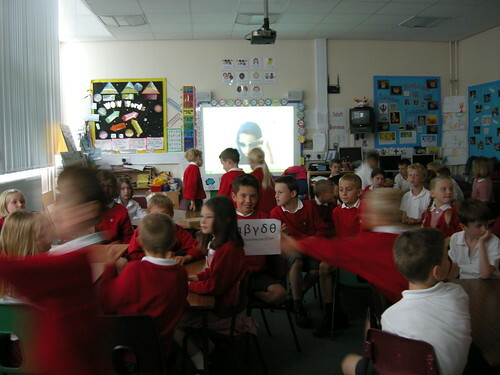 It was great for me to be able to run the game (although I never actually called it that in front of the pupils) 3 times back-to-back, because it meant I was able to try different formats and tweak things that weren’t quite working as well as I wanted. At the end of the day there was a final session where the pupils were again asked for their thoughts on the different activities they had taken part in, this time feeding back verbally in response to questions such as: did you think the activity was better suited to any particular year groups; what did you enjoy about the activity; and what aspect of learning did they think it was relevant to. I followed my last group into their final session and so was able to get a feel for how positively it had been received. I missed whether they thought it was suited towards a particular age group, which was a shame because I want to know how the youngest children got on with it. There was potentially a large focus on writing during the game, and I wanted to check whether the working in pairs (and often with a teacher supporting them), coupled with the verbal reporting-back sessions, meant that they were still able to express their ideas in a way that wasn’t too daunting (more important to me than actually generating written documentation). A really interesting thing that came out during this evaluation was how much the pupils were linking it to their maths and science lessons. It’s possible it could also have been influenced by us working in the science room, but they were mostly making an incredibly strong connection to the containers of liquid and their work on capacity etc! Another piece of feedback I received, this time from a member of staff at lunch time, was the value of the reporting-back sessions in going towards developing some much-needed speaking and listening skills. This was really useful, because up until then I had been a little bit concerned about the pacing and whether this bit slowed things down too much.